The epic main event at UFC FIGHT NIGHT: ASSUNCAO vs. MORAES is a mouthwatering rematch of Raphael Assuncao’s split decision win over Marlon “Magic” Moraes at UFC 212: ALDO vs. HOLLOWAY. No. 3 bantamweight Raphael Assuncao also approaches the bout in flying from having been awarded performance of the night following his knockout of Matthew Lopez at UFC FIGHT NIGHT: POIRIER vs. PETTIS. With both fighters coming into the bout in red-hot form, there are sure to be fireworks as “Magic” looks to gain revenge and continue his mighty knock-out streak in the Octagon this weekend. UFC FIGHT NIGHT: ASSUNCAO vs. MORAES 2 will see Charles “Do Bronx” Oliviera go for a record-breaking 13th submission victory in the UFC. Oliviera has walked away from his last three fights with the ‘performance of the night’ accolade to his name; will he be able to write his name in this history books this weekend? Sweden’s David Teymur is the man who stands in his way and will be sure to provide strong opposition. Teymur has won his last eight consecutive fights and is rapidly making a name for himself in the UFC lightweight division. Known for his ability to KO opponents in the early rounds, Teymur has recently shown remarkable endurance to see off competitors such as Nik Lentz. Both fighters will be full of confidence making for a thrilling clash of styles come the weekend. The former UFC featherweight champion and current no. 2 featherweight Jose Aldo has experienced a number of up and downs in his career. 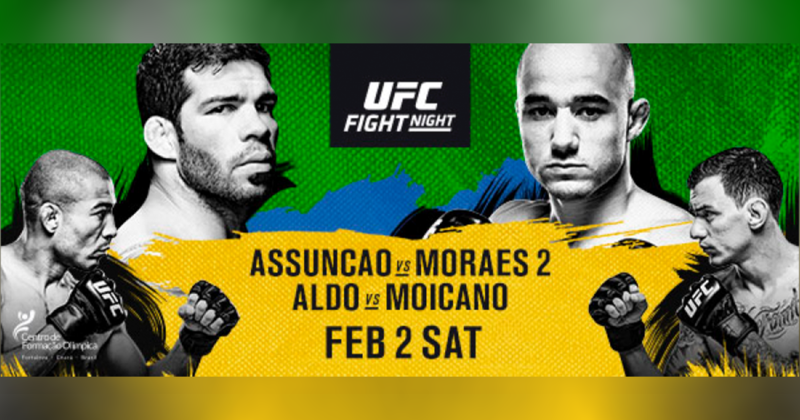 However, the man with some of the most dangerous leg kicks in the UFC will be aiming to capitalise on rediscovered momentum and register a second consecutive win at UFC FIGHT NIGHT: ASSUNCAO vs. MORAES. The veteran Renato “Moicano” Carneiro, has fought in the Octagon six times, with only one loss in a fight of the night performance. An impressive win over Jose Aldo would launch Carneiro into the featherweight rankings. Expect both of these fighters to enter the Octagon with points to prove, whether the fight is standing or on the ground, both will gain a lot from a convincing stoppage.